Not long after my last post, I decided to say bugger it and began allowing myself a few hours of gaming on the weekends. Between the stress of the carpal tunnel and other real life problems (suddenly being left with a mortgage I can barely afford being a big one), I needed some sort of outlet for my stress before I went completely crazy. I’ve mostly been sticking to slower games that I can play with a controller: The Sims 3, The Long Dark, Banished, and Stonehearth to name a few. 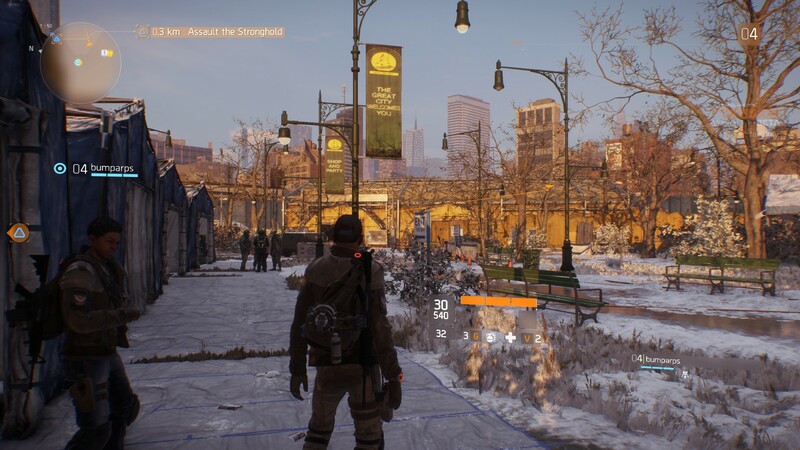 But this past weekend was The Division’s open beta, so Lord Crumb and I spent a few hours playing it Sunday afternoon. I’ve never played a Tom Clancy game before (or read the books) but I’ve been interested in The Division for a while, namely because it’s a co-op shooter that looks like it’ll also feature crafting. Besides, I always love a post-apocalyptic setting and this one is all about helping people. The character creation was severely limited for the beta, where you’re only allowed to pick your gender and hit the Randomize button a bunch of times. Without even planning it, Lord Crumb and I both choose black women for our characters who look similar enough to be sisters or twins. Getting him to join my game was really easy I should add. We were already on each other’s friendslist through Uplay and all of the inviting/joining was done in a few clicks right within the game. The graphics are ridiculously detailed and generally amazing, but soon I had to turn everything down to medium to be able to play. Even still, I was getting random lag spikes similar to what Belghast described, where my FPS would drop sharply for several seconds when moving to a new area, but then it would be fine. I don’t think the problem is related to actual graphics but maybe the load on the CPU. I don’t think it’s my internet because that should result in rubberbanding instead. I had this issue while playing Dying Light as well so it’s not isolated to just The Division. It’ll be something I have to look into more. The only place we saw other players was in an area called The Hub, outside of that it was just the two of us which we liked. 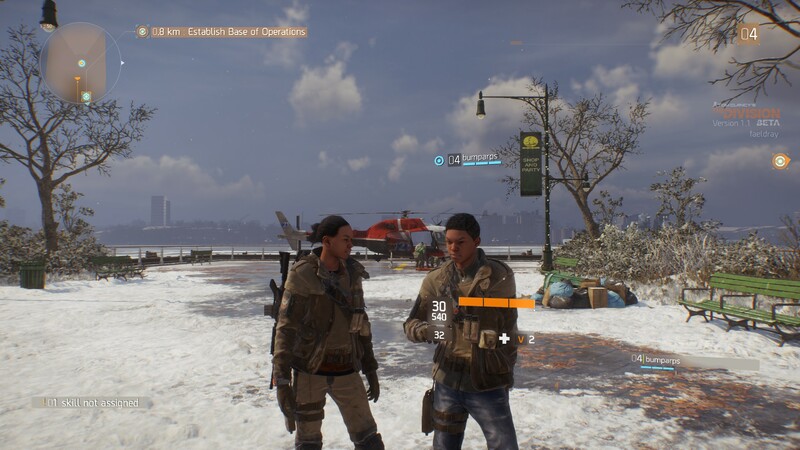 I read that there will be other players in the PvP area The Dark Zone, but neither of us have any interest in that sort of thing. Apparently some people like UltrViolet thought this game was to be an MMO, which I don’t blame them for since it’s being covered by MMO news sites for…reasons? I dunno, to me, an MMO is a game where you can encounter other random players not in your party for the majority of your playtime. The Hub feels more like a prettier lobby than anything else. The third-person view and the cover system reminded me of the one in Mass Effect, which I didn’t realize I’ve been missing until Sunday. (And Lord Crumb thinks he doesn’t need to use cover since he found a shotgun.) The random events you can stumble across and the open urban map remind me of Dying Light with less parkour. Both of these together were a lot of fun, even if I felt the urge to scramble up sheer walls like I got used to in Dying Light. We didn’t come across too many bugs for the most part, just some items that we couldn’t seem to pick up or the indicator for them glitched. Crafting didn’t seem to be implemented yet, or maybe we just never figured out how to access it. We also came across an Echo that we never did figure out what to do with, or even if we were suppose to do anything with it. And we were too distracted by side missions to get around to the main quest of establishing a base. Unfortunately we had to stop after a few hours because my hand/arm was beginning to hurt. I had tried using the Steam controller at first but it wasn’t working the way I wanted so I had been using a mouse and keyboard. I later went back and customized the controller settings enough that I think it would have worked out in the end. So maybe after the game is out, I’ll be able to play it with the controller. In all likeliness, I’m not going to buy The Division now but wait a while for it to come on sale and to bypass the bugs that will likely be there at launch. But I’m still looking forward to getting it and playing with Lord Crumb.